In a world where many people already feel so cynical about love, it is wonderful to see proof that a long and lasting love could still exist in the real world! Such proof could be seen in the snapshot of an old man who was ‘stealing’ a photo of his wife while they were both attending their granddaughter’s wedding. The photo was taken at a wedding in Mexico. 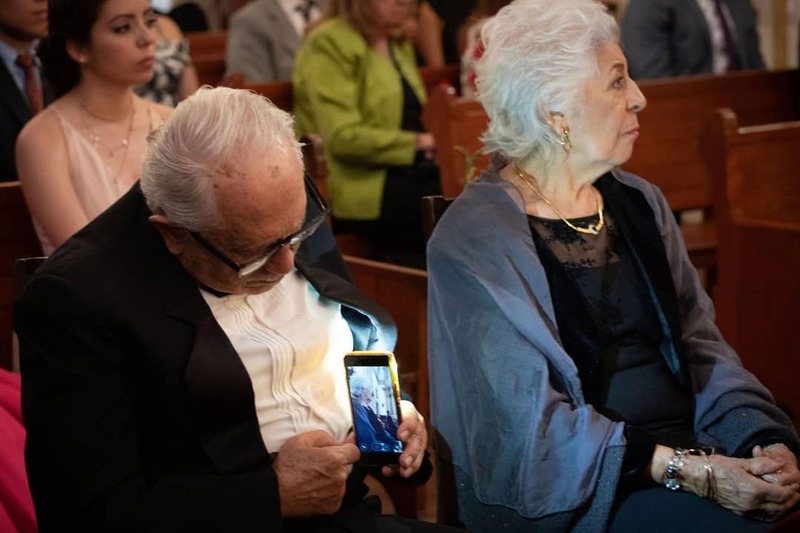 Photographer Edmundo Cambron was covering the wedding when his attention was drawn by an old man shifting on his seat to move his phone in such a way that he could photograph his wife without her noticing at all! Knowing that he just witnessed a beautiful moment, Cambron hurriedly snapped pictures as he was truly touched by this old man’s gesture. The old man’s wife really had idea what he was up to as she regally sat there, watching the wedding proceedings. Despite being old, this old man was still so obviously in love with his wife! After all, you’d think only teenagers would steal a photo of their crushes, right? Yet this old man is doing the exact same thing to his wife! So cute. Cambron later revealed that this old couple were the bride’s grandparents, 80-year-old Emilio Sanchez and his wife, Teresa Regla. Amazingly, the two have been together for over 55 years already, yet it seems that they are still as in love as if they were still so young. “Yesterday I shared this photo, which had a very good response and I want to tell you that thanks to these two people, many couples remembered what love is, now they become a symbol of love,” Cambron shared on his Instagram account. And wouldn’t you know it – the old man replied to the post! “I am 80 years old, I have Facebook, I have an intelligent cell phone and a wife that I love and has been with me for the last 55 years of my life,” Sanchez commented.